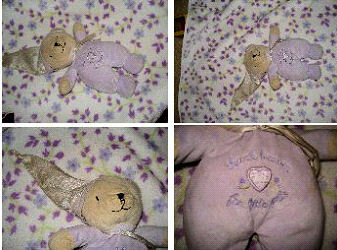 I’m looking for the same bear that Terri was searching for … a lavender purple bear by Carter’s, wearing a night cap. It says “Thank Heaven for Little Girls”. My daughter, who just turned 2 on Christmas Eve, calls her “baby”. I received this teddy bear at my baby shower. Unfortunately as time moves on so does the wear and tear of her “baby”. We must take the teddy bear “baby” with us everywhere we go. My daughter Kendra sleeps with her “baby” and takes it to day-care with her. We are trying to find another baby because hers is now starting to get a hole in the back, and she keeps sticking her fingers in it. I don’t think “baby” is going to last too much longer. Here is a pink one if that might do. But tami is amazing… you wait till she looks… if there is one to be found she will find it. Tami R you make me LOL and blush a little. You too are an amazing searcher. I’ve been searching on this. I’ve found a pink, blue, green, but not lavender yet. people are going to think I am blogging with myself, don’t worry I’m not…..at least I don’t think I am. It keeps me confused, having a tami r AND a Tami R both being Fabulous Finders!!! It does sound like you are talking to yourself, and yes, you are BOTH great hunters!!! I need a lavender one too! My daughter lost hers and she misses it at bedtime. Please let me know if you find one. Please contact us so we can help you Jackie!! Here are two more. Let us know if you have found the bear or quit looking. Hope these help. If any are still looking here are the bears on ebay. Let us know.